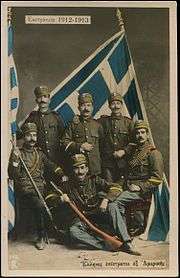 Greek Americans (Greek: Ελληνοαμερικάνοι, Ellinoamerikanoi) are Americans of full or partial Greek ancestry. About 1.3 million American people are of Greek descent, although there are estimates that raise this number to 3 million, and 321,144 people older than five spoke Greek at home in 2010. Greek Americans have the highest concentrations in the New York City, Boston, and Chicago regions, but have settled in major metropolitan areas across the United States. In 2000, Tarpon Springs, Florida was home to the highest per capita representation of Greek Americans in the country (11%). The United States is home to the largest overseas Greek community, ahead of Australia, Cyprus, Albania, Canada, Germany and the United Kingdom. About 500 Greeks from Smyrna, Crete, and Mani settled in New Smyrna Beach, Florida in 1768. The colony was unsuccessful, and the settlers moved to St. Augustine in 1776. The St Photios Greek Chapel exists as a remnant of their prescense, and is believed to be the oldest still standing Greek Orthdox religious structure in the United States. Greek immigration at this time was over 90% male, contrasted with most other European immigration to the U.S., such as Italian and Irish immigration, which averaged 50% to 60% male. Many Greek immigrants expected to work and return to their homeland after earning capital and dowries for their families. However, the loss of their homeland due to the Greek Genocide and the 1923 Population exchange between Greece and Turkey, which displaced 1,500,000 Greeks from Anatolia, Eastern Thrace and Pontus caused the initial economic immigrants to reside permanently in America. The Greeks were de jure denaturalized from there homelands and lost the right to return, and their families were made refugees. Additionally, the first widely implemented U.S. immigration limits against non Western European immigrants were made in 1924, creating an impetus for immigrants to apply for citizenship, bring their families and permanently settle in the U.S. Fewer than 30,000 Greek immigrants arrived in the U.S. between 1925 and 1945, most of whom were "picture brides" for single Greek men and family members coming over to join relatives. 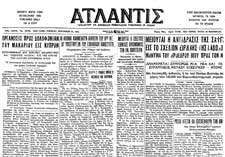 The Atlantis was the first successful Greek language daily newspaper published in the United States. 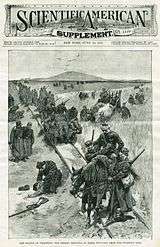 The newspaper was founded in 1894 by Solon J. and Demetrius J. Vlasto, descendants of the Greek noble family, Vlasto.i[›] The paper was headed by a member of the Vlasto family until it closed in 1973. 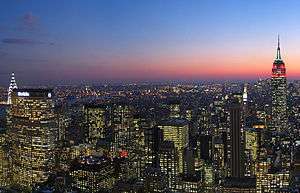 Published in New York City, it had a national circulation and influence. Atlantis supported the royalist faction in Greek politics until the mid-1960s. Atlantis editorial themes included naturalization, war relief, Greek-American business interests, and Greek religious unity. The 1970s television-series Arnie  depicted aspects of Greek American life. Several entertainers and other performing artists including Johnny Otis, Kelly Clarkson, Alexander Frey, John Aniston, Jennifer Aniston, Melina Kanakaredes, Zach Galifianakis, Tommy Lee, Demetri Martin, Paul Cavonis, Criss Angel, Elias Koteas, Amy Sedaris, Andy Milonakis, Cat Stevens and Billy Zane are of Greek descent. 1 2 "Total Ancestry Reported". United States Census Bureau. 2010. Retrieved 4 December 2014. 1 2 "U.S. Relations With Greece". United States Department of State. 10 September 2013. Retrieved 4 December 2014. 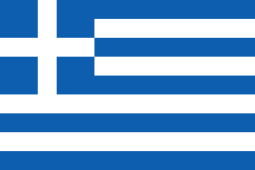 Today, an estimated three million Americans resident in the United States claim Greek descent. 1 2 3 4 "SELECTED POPULATION PROFILE IN THE UNITED STATES 2010-2012 American Community Survey 3-Year Estimates". United States Census Bureau. Retrieved December 13, 2014. 1 2 3 "SELECTED POPULATION PROFILE IN THE UNITED STATES 2010-2012 American Community Survey 3-Year Estimates". United States Census Bureau. Retrieved December 13, 2014. 1 2 "SELECTED POPULATION PROFILE IN THE UNITED STATES 2010-2012 American Community Survey 3-Year Estimates". United States Census Bureau. Retrieved December 13, 2014. 1 2 "SELECTED POPULATION PROFILE IN THE UNITED STATES 2011-2013 American Community Survey 3-Year Estimates". United States Census Bureau. Retrieved December 13, 2014. ↑ "Most spoken languages in the entire US in 2010". Modern Language Association. Retrieved 5 December 2014. 1 2 "Yearbook of Immigration Statistics: 2012 Supplemental Table 2". U.S. Department of Homeland Security. Retrieved 2013-04-01. ↑ "Yearbook of Immigration Statistics: 2009 - Supplemental Table 2". Retrieved 2010-04-24. ↑ "Cabeza de Vaca's La Relacion". Retrieved 17 March 2015. ↑ Archived April 18, 2005, at the Wayback Machine. ↑ "A Nation of Peoples". Retrieved 17 March 2015. ↑ Barkan, Elliot Robert (1999). A Nation of Peoples: A Sourcebook on America's Multicultural Heritage. United States: Greenwood Press. pp. 252–253. ↑ Archived March 11, 2006, at the Wayback Machine. ↑ "Picture Bride Era in Greek American History". Retrieved 17 March 2015. ↑ Berger, Joseph (March 16, 2008). 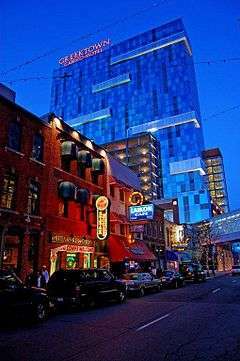 "Diners in Changing Hands; Greek Ownership on the Wane". New York Times. Retrieved 2009-05-27. ↑ Kleiman, Dena (February 27, 1991). "Greek Diners, Where Anything Is Possible". New York Times. Retrieved 2009-05-27. ... Greeks became a visible presence in the diner and coffee shop business in the late 1950s after several waves of immigration. They congregated largely on the East Coast, where the food service industry provided an easy economic foothold for many immigrants who were often unskilled and unable to speak English. As with immigrants from many nations, one relative would send word of opportunity back home, encouraging others to come to America. 1 2 Annie Correal and Colleen Wright (July 5, 2015). "Greeks in New York Talk and Cheer, Then Debate Future After Referendum". The New York Times. Retrieved July 5, 2015. ↑ "Ancestry: 2000". United States Census Bureau. Retrieved 30 November 2012. ↑ "Total ancestry categories tallied for people with one or more ancestry categories reported 2010 American Community Survey 1-Year Estimates". United States Census Bureau. Retrieved 30 November 2012. ↑ "Ancestry Map of Greek Communities". Epodunk.com. Retrieved 2008-08-12. ↑ "Top 101 cities with the most residents born in Greece (population 500+)". city-data.com. Retrieved 2008-08-12. ↑ "Appendix Table 2. Languages Spoken at Home: 1980, 1990, 2000, and 2007.". United States Census Bureau. Retrieved August 6, 2012. ↑ "Detailed Language Spoken at Home and Ability to Speak English for Persons 5 Years and Over --50 Languages with Greatest Number of Speakers: United States 1990". United States Census Bureau. 1990. Retrieved July 22, 2012. ↑ "Language Spoken at Home: 2000". United States Bureau of the Census. Retrieved August 8, 2012. ↑ "Mother Tongue of the Foreign-Born Population: 1910 to 1940, 1960, and 1970". United States Census Bureau. March 9, 1999. Retrieved August 6, 2012. ↑ Magny, Claude Drigon. Livre D'or De La Noblesse Européenne, Ed. 2. Paris: Aubry, 1856, pg. 441. ↑ "Arnie (TV Series 1970–1972)". IMDb. 10 April 2001. Retrieved 17 March 2015. ↑ "paideiausa". paideiausa. Retrieved 17 March 2015. ↑ "NHSA". Retrieved 17 March 2015. The Museum Of Greek Culture at the The New England Carousel Museum constructed by The Hellenic Society Paideia housing a Macedonia exhibit.